OK, honestly? It can be hard to appreciate the Big Apple while it’s baking in the sun. But you needn’t resign yourself to three months of mopping your sweat off of the subway platform, surrounded by mocking, un-swimmable rivers. Go to the pool! We’ve got so many fabulous options in New York, whether you’re game to have an exclusive staycation experience on a hotel rooftop, or you’re looking to beat the heat for cheap at one of NYC Parks’ many free, public options. Here are our top picks -- the chlorinated water is calling your name. A rooftop pool that doesn’t charge a cover? Yes, please. 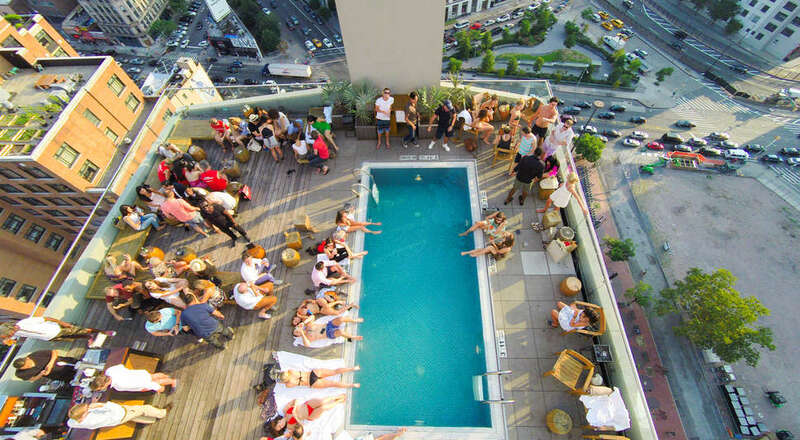 This nirvana 18 stories up is limited to guests of The James Hotel during the day, but come late afternoon, the pool -- and its panoramic views of Midtown, Wall Street, and the Hudson and East Rivers -- are fair game for locals. You might not need to shell out at the door, but you will at the bar; cocktails will run you $19. Even mocktails cost $14. 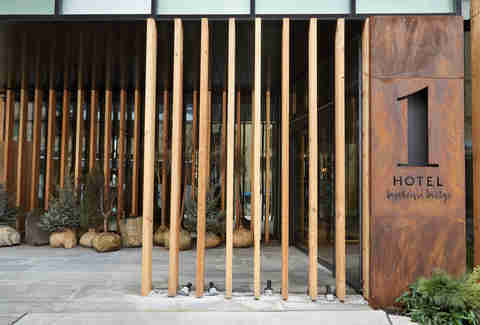 Reservations are recommended, but not required. For folks in the Bronx, Mapes Pool is a summer staple. It’s one of five public pools in each borough (of 53 free outdoor pools overall) that NYC Parks made-over in time for swimsuit season -- the first major renovation any of them have had since they were built in the 1970’s. The intermediate-sized pools have been spruced up with colorful paint jobs, polar-themed decals, new furniture, and new plantings, ‘cause it’s important that your pool looks as fresh as you do in that new suit. We love us a good unicorn float, but actually swimming is great, too. What better way is there to get a killer workout without the nasty summer sweat? Michael Phelps wannabes should consider lessons; Imagine Swimming offers adult swim classes in the early mornings and evenings, Monday-Friday, at their flagship pool in Tribeca. Private sessions are $135, and two-person sessions are $75. Students are welcome to dip into free swim periods on Sundays for extra pool time at no additional charge. “Swim with the fishes,” might mean one thing to some New Yorkers, but to “swim at the Fisher” is a decidedly positive experience. Although the Astoria Park pool is better known (read: more crowded), the city gave this spot its “Cool Pools NYC” treatment, so you can bask in that luxurious new paint job. (It’s free, what do you expect?) Note: all of the public pools in NYC close from 3-4pm for cleaning, so use that downtime to check out some of the amazing cuisine in Queens. 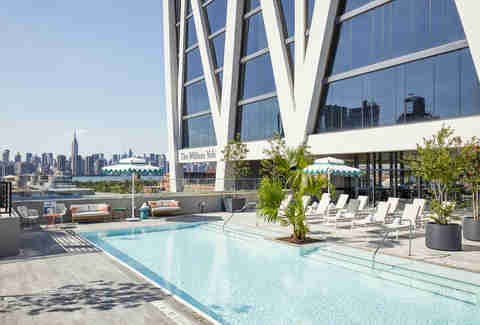 With 4,800 square feet of deck space, the McCarren is one of the largest outdoor heated swimming pools in the city, and has long been considered a summertime hot spot. As its popularity rises, so does its entry fee: Day passes are $45 Monday-Thursday and $65 Friday-Sunday. Seating is first come, first served, until they hike the price and re-open reservations in July. Complimentary Wi-Fi is included, at least, so everyone on the ‘Gram can know how you’re hanging in real time. 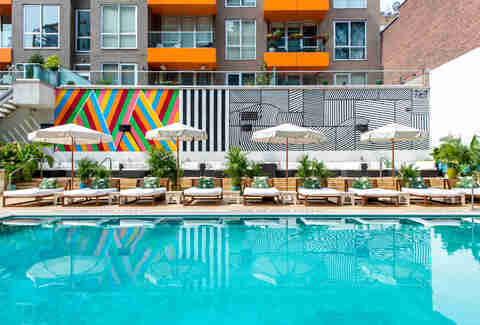 Another recipient of the city’s “Cool Pools NYC” renovation, Sheltering Arms is the best place to get your splash on in Harlem. All are welcome to swim laps or chill beneath one of the new cabana-style shade structures. Like all NYC public pools, this one is free, and they even offer complimentary SPF 50. The only thing better than watching the sunset from a rooftop is watching it from inside a rooftop’s heated pool. The Gansevoort Meatpacking offers postcard views of Manhattan and the Hudson River, made even better with a craft cocktail in hand. The weekends are reserved for hotel guests only, but guest passes will be available Monday-Thursday. The the fee and opening date are TBD, but last summer day passes went for $150. Who says pool access needs to be limited to the summer? NYC’s recreation centers are indoors, and thus open all year round. Annual membership is $150 for adults, and $25 for seniors (62+), young adults (ages 18 through 24), veterans, and people with disabilities. Membership is free for minors. Chelsea Pool is one of the most prominent locations, and its long hours make it easy for even the busiest bodies to find time for a dip. Much like the rest of the LIC neighborhood, the Profundo Day Club at the Ravel Hotel offers a stellar product for a still relatively reasonable rate. 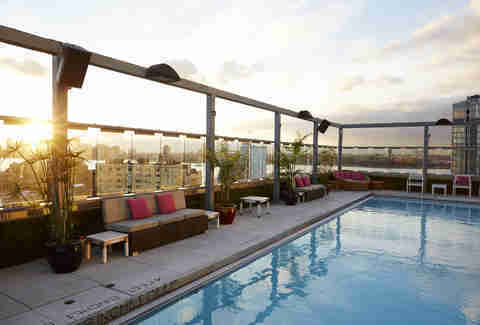 A full day pass to the rooftop pool is $50, and includes a complimentary towel and Profundo pool bag. Admission to a “sunset session” at the pool (access from 12-9pm) starts at $25. Neither include seating; if you want to comfortably sunbathe it’ll cost you $100 for a partial day’s use of a chaise lounge, and up to $1,200 for an all-day poolside cabana for eight. Complete pricing can be found on their Eventbrite page. As tempting as the Gowanus Canal may look (and smell), swimming in it is unfortunately inadvisable. Enter Douglas and DeGraw, Brooklyn’s most recently renovated public pool. Pro tip: Free swimming lessons are offered here, and at all of New York’s outdoor public pools. Additional pro tip: While stopping at Whole Foods on your way may be convenient, outside food is not allowed. Save your snacking for the end of the day. You’re more likely to find a friend with a pool on Staten Island than in any other borough, but you have enough friends. Instead, boogie on over to the newly renovated West Brighton Pool for a day of fun in the sun. What to bring: a sturdy combination lock to keep your valuables safe. What not to bring: valuables! Leave the watch at home and pretend “island time” applies to Staten. 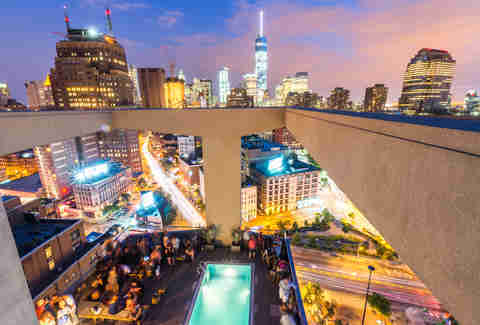 One of the most coveted views of the year is from the rooftop plunge pool at the 1 Hotel Brooklyn Bridge. The space boasts some seriously unparalleled views of the East River and Manhattan skyline, has a full-service bar, fire pits, and seating made from reclaimed railroad ties. (BROOKLYN!!) Typically reserved for guests of the hotel, the pool will be open to the public (21+) on the weekends, but the prestige will cost you; a table reservation is required with a $500 food and beverage spending minimum. At publication time, rooms booked one month in advance started at $399. 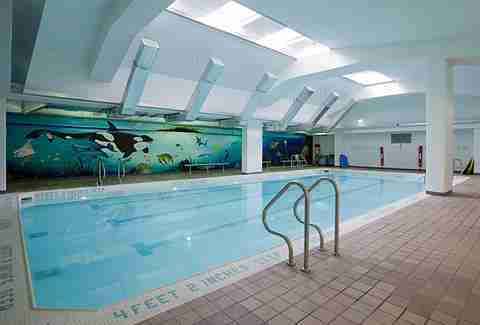 This indoor pool is only one of two in the city that offers women-only swimming hours. It’s a positively wonderful amenity for female members of the local Hasidic community, as well as any lady who wants to rock her swimsuit without dealing with the burden of the male gaze. The pool also offers general swim time for all community members. Swimming caps required.